Losing data is one of the most annoying situations and data loss can happen to external as well as internal hard disk due to various factors. 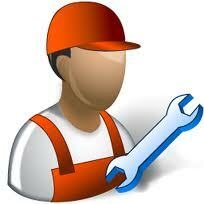 Fortunately, now you have various data recovery tools that help you in recovering your files. In this article, we will tell you one of the best hard disk recovery software and how to recover data from hard disk efficiently and smartly. Part 1: What is Hard Drive Recovery? Part 2: How to Choose Hard Drive Data Recovery Software? Part 3: How to Recover Data from Hard Drive? Hard drive recovery is the process of retrieving data after the hard drive is damaged, corrupted, erased or crashed. Luckily, one can easily recover files from damaged hard drive or disk and all thanks go to the wonderful hard drive recovery software. Using the software, you can effortlessly and quickly recover files from hard drive. Today, the hard drive is susceptible to various data loss situation. Under data loss scenario, you need data recovery software which allows you to get back your precious files from hard drive. Accidental deletion of data is the most common data loss situation and it is faced by many people worldwide. Thus, if you have deleted the data on the hard drive by mistake and now you want to get back then hard drive recovery software is the ultimate solution for you to retrieve deleted files as fast as possible. Many people don't know that when we delete files unintentionally, files are not deleted permanently and it just gets stored in binary form. Data recovery software can read that binary data and recover it. Today, it is normal to hear that file got corrupted and there can be many reasons for the file corruption. However, no matter how the file got corrupted on hard disk, hard disk recovery software can also recover corrupted files with great ease. Another scenario when you need hard drive data recovery is virus or malware attack to your hard drive. It is also one of the common data loss situations. A virus attack can delete or corrupt files present on the hard drive. The virus can occur to external hard drive if you connect it to a computer which is virus infected. Data on the hard disk can be lost due to the system crash or failure. Data recovery software can also able to recover lost files in this situation. There are a plenty of data recovery tools available on the internet and all claims the 100% success rate for recovery. However, only a handful of them work efficiently and give the desired results. Thus, when it comes to selecting hard drive recovery software, you need to consider many factors. First and very important, its success rate in recovery under different data loss situation. Another vital factor you need to consider is how fast it can recover data from hard disk. Among various data recovery tools, Any Data Recovery is the most recommended software for hard drive recovery. It is known as the professional data recovery software that can recover deleted, lost, or formatted files from hard drive with great ease on the computer. It can recover various types of files including videos, photos, documents, music, and many more. It is designed not just for the hard disk recovery, but for many other removable media such as USB drive, memory card and many more. With its free version, you can retrieve 500MB files. It offers 100% success rate for recovery. It can recover data under any kind of data loss scenario. It uses two modes to scan files, quick and deep scan. 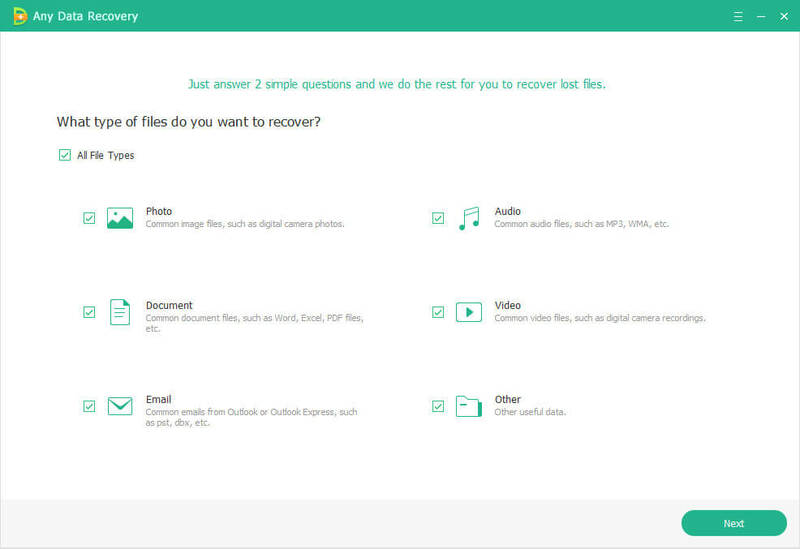 Before recovery, the software let you preview lost files. Thus, Any Data Recovery comes with remarkable recover features. It has a free version, so, you can give try to the software to explore its features on your own. It is compatible with both Windows and Mac operating system. Recovery data from a hard drive using Any Data Recovery is a time-efficient and hassle-free process. With its free version, you can do various type of recovery on Windows operating system. Step 1: To begin it, download and install software from its official site on your computer. After installing it successfully, run the software. 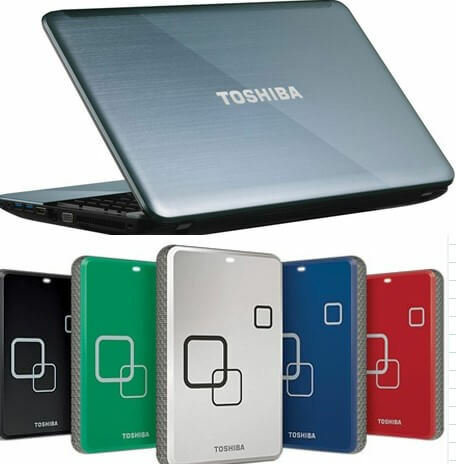 Step 2: Thereafter, if it is external hard drive then connect your hard drive from which you want to recover data to a computer. Else, select the target partition on your computer and then, select file type you want to recover from the connected hard drive. Step 3: After that, select the location where you want to scan lost files and thereafter, tap on the "Scan" button. Step 4: Once scanning is completed, the lost files will be displayed on the software interface. You can preview files and then, select those you want to get back. Then, tap on "Recover" button. Note: Go for the Deep Scan mode, if a quick scan is not able to give your desired files you are looking. Step 5: Finally, you need to enter the destination location where you want to save recovered files on your computer. Thus, recovering lost files is no more difficult process because of the reliable disk recovery software like Any Data Recovery. It is a complete solution for every type of data recovery and you can get back your files irrespective of how you lost.